Santa Ana, CA (April 17, 2014) The City of Santa Ana is pleased to announce that the Facilities-Fleet-Central Stores (FFCS) Division is the 2014 Green California Leadership Award winner in the Transportation category. The award is given by Green Technology Magazine, the e-magazine arm of a California non-profit initiative designed to provide a forum for connecting public and private leaders and resources to promote the development and distribution of sustainable green technologies. The award was presented on April 8, 2014 during the Green California Summit Leadership Awards Ceremony in Sacramento, California. Since 2006, the Summit has recognized public sector accomplishments in eight categories that cover programs, strategies and technologies being implemented to preserve the natural resources of the Golden State. 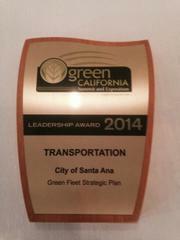 Santa Ana was recognized for developing and implementing a five-year Green Fleet Strategic Plan that reduced the City’s carbon footprint by downsizing the City fleet inventory from 950 to 651 cars, trucks and pieces of equipment by 2013. Also, in early 2014, 20 percent of the City fleet, or 125 vehicles, had been converted from running on conventional fuels to alternative energy sources. The City is working towards a 75 to 80 percent alternative-fueled fleet in the next five to seven years.